We have major updates to Dedicated Interconnect, which helps enable fast private connections to Google Cloud Platform (GCP) from numerous facilities across the globe, so you can extend your on-premises network to your GCP Virtual Private Cloud (VPC) network. With faster private connections offered by Dedicated Interconnect, you can build applications that span on-premises infrastructure and GCP without compromising privacy or performance. Dedicated Interconnect is now GA and ready for production-grade workloads, and covered by a service level agreement. Dedicated Interconnect can be configured to offer a 99.9% or a 99.99% uptime SLA. Please see the Dedicated Interconnect documentation for details on how to achieve these SLAs. Dedicated Interconnect now supports global routing for Cloud Router, a new feature that allows subnets in GCP to be accessible from any on-premise network through the Google network. This feature presents a new flag in Cloud Router that allows the network to advertise all the subnets in a project. 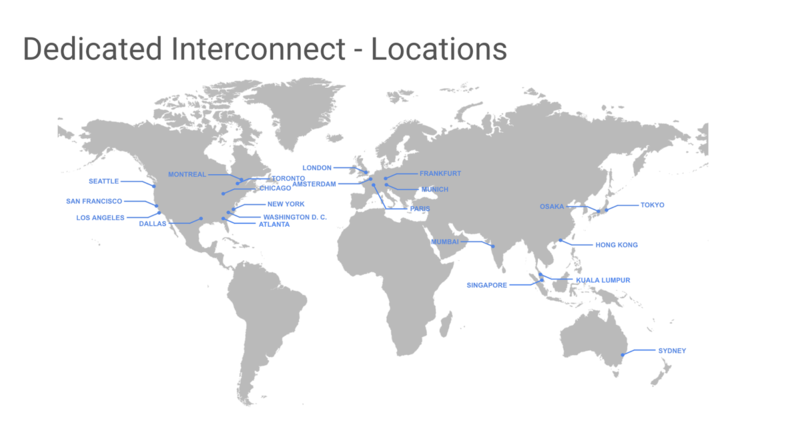 For example, a connection from your on-premise data center in Chicago to GCP’s Dedicated Interconnect location in Chicago now gives you access to all subnets running in all GCP regions around the globe, including those in the Americas, Asia and Europe. We believe this functionality is unique among leading cloud providers. This feature is generally available, and you can learn more about it in the Cloud Router documentation. Using Cloud Router Global Routing to connect on-premises workloads via “Customer Peering Router” with GCP workloads in regions anywhere in the world. Dedicated Interconnect is also available from four new locations: Mumbai, Munich, Montreal and Atlanta. This means you can connect to Google’s network from almost anywhere in the world. For a full list of locations, visit the Dedicated Interconnect locations page. Please note, in the graphic below, many locations (blue dots) offer service from more than one facility. In addition to those four new Google locations, we’re also working with Equinix to offer Dedicated Interconnect access in multiple markets across the globe, ensuring that no matter where you are, there’s a Dedicated Interconnect connection close to you. Here at Google Cloud, we’re really excited about Dedicated Interconnect, including the 99.99% uptime SLA, four new locations, and Cloud Router Global Routing. Dedicated Interconnect will make it easier for more businesses to connect to Google Cloud, and we can’t wait to see the next generation of enterprise workloads that Dedicated Interconnect makes possible. If you’d like to learn which connection option is right for you, more about pricing and whole lots more, please take a look at the Interconnect product page.